Nancy Grace (Hallmark Movies and Mysteries' "Hailey Dean Mysteries"); comic Sebastian Maniscalco. "To this day, I don't judge on the breed. I still love this dog." A South Florida woman says a lost dog she took in turned out to be a total terror. NBC 6 anchor Johnny Archer reports. A South Florida woman says she opened her heart and her home to a stray dog, only to have that animal turn into a total terror -- first killing her cat, then attacking her and leaving her with severe physical and mental wounds. "Something had switched in his mind," Sabreena Deen said. "It seemed like he just saw red and started attacking me." At the beginning of the year, Deen found Zeus, a 90-pound American bulldog, wandering the streets. The dog was microchipped, so Deen was able to find the owner, who had recently moved to Peru and left the dog to a friend. The owner had no idea Zeus was lost and asked Deen to watch over him until a friend can pick him up. Deen, an animal lover, took the dog in. She fell in love with Zeus. And she never thought he'd turn on her. Nearly a month later, Zeus killed Deen's cat. Two days later, he attacked Deen inside her Hollywood home. 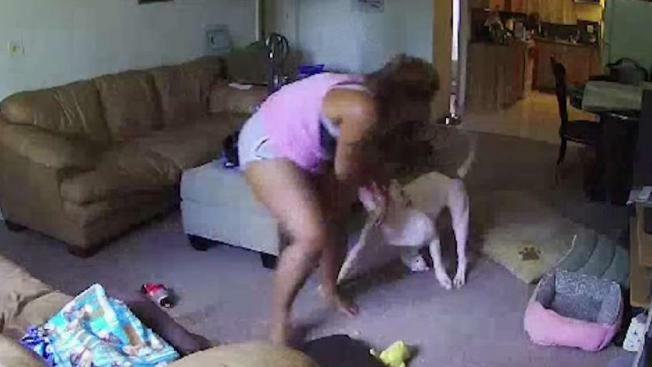 Surveillance cameras captured the attack. "I was trying my hardest to get him off of me," she said. "And I was punching and he wouldn’t let go. I was even saying to him, 'Zeus, please stop, please stop,' thinking that he might know he's biting me, the person that’s been taking care of him for so long." Thankfully, Deen's father was outside and came rushing in to help pull Zeus off of her. But before it was all over, Zeus ripped apart Deen's arm and took out a chunk of her left thigh, leaving her physically and mentally scarred. "I'm getting more and more frustrated every day that I can't use both of my arms and hands and that I don’t have full movement," she said. "And I walk like an old lady now because my left leg is so mangled up. So that’s been very tough." Deen, who doesn't have insurance, has had five surgeries since the attack and estimates her medical bills will total at around $200,000. Her family set up a Gofundme to help with the costs. Deen now lives with a friend because she is unable to take care of herself. She is unsure when she will able to come back to work. "I'm not 100 percent sure I'll have my job after this," she said. "It's all up in the air and we are just going day by day." Despite all of this, Deen still feels awful about Zeus being put down after the attack. "To this day, I don't judge on the breed," she said. "I still love this dog, it's sad to say. But I'm an animal person."